Higher-ups at Mars One are disputing allegations by a former astronaut candidate that the colonization effort judges its applicants unfairly and is unable to finance itself. Mars One is a nonprofit organization that aims to establish a human settlement on the Red Planet via a series of one-way trips. 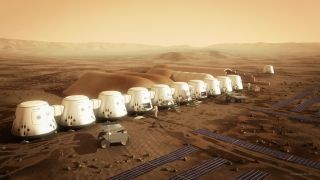 While its finances are not fully firmed up yet, Mars One representatives have said they will use capital from private investors, coupled with sponsorship deals, to bankroll the project. In March, the organization pushed back its first manned Red Planet landing by two years to 2027, citing a delay in investment funding. "After completing the interview stage, I felt that the selection process was not rigorous enough to reach the requisite standard of more traditional astronaut selection programs," Roche wrote in the article. Roche's article came a month after The Guardian ran a list of "Top 10" candidates for Mars One who were selected by organizers based on the number of "points" each candidate had garnered during the selection process. Roche said these points were based on how much money the candidates donated to Mars One. "I think that the shortcomings of the selection process, coupled with their unwillingness to engage and collaborate with the scientific community, means that the time might have come for Mars One to acknowledge the implausibility of this particular venture," Roche wrote. "They could then perhaps turn their efforts towards supporting other exciting and more viable space missions." Two finalists on Mars One's list backed Lansdorp, telling Space.com that they were not ordered to contribute money to be eligible for selection, although the organization did encourage everyone to chip in through voluntary purchases, such as buying T-shirts. "It seems clear to me from the documentation on the website before the selection, before the process began, that Mars One has stated there will be no consideration for candidate selection based upon their material participation," said Peter Degen-Portnoy, a finalist in the Boston area. "We’ve closed a deal with a consortium of investors; the deal is signed, but it's only done when the money is in the bank," Lansdorp said. "Documents need to be prepared and approved and modified, and that's taking a lot longer than I expected." Should the deal close, the money will be enough for Mars One to continue for roughly 2.5 years through the training and selection process, he added. As for the selection process, both Lansdorp and Kraft told Space.com that the interviews — which winnowed down the list from more than 1,000 people to 100 — were short because the selection process isn't complete. So far, Kraft said, the interviews have been brief and focused on general knowledge to test how willing the candidates are to learn, and if they understand the concept of risk. The next round will be more rigorous, Lansdorp and Kraft said. Van Meter said she expects this to be the case. "So far, they are looking at us, I think, as people, and I think the next step, in Round 3 or 4 — which they haven't talked about terribly much — we know it's going to be considerably more intensive," she said. Until Mars One shows that it has closed a significant financing deal, it's difficult to know if the organization is capable of making it to the Red Planet, said space policy expert John Logsdon. "They haven't shown any evidence that they have funding of a magnitude able to buy the hardware to get people to the Martian surface, or even to conduct the precursor robotic missions they contracted for," Logsdon, a professor emeritus at The George Washington University, told Space.com. Logsdon said that, given this situation, he is astounded by the amount of media coverage Mars One receives. He added that an organization such as Explore Mars — another nonprofit — has more carefully thought through logistical and financing issues, which Logsdon heard about when he participated in the organization's Humans to Mars Summit earlier this year.